Milly-Molly-Mandy lives in a tiny village in the heart of the countryside. She is always busy doing things, and whether she is blackberry-picking with little-friend-Susan or keeping shop for Miss Muggins, you're sure to have fun when Milly-Molly-Mandy's around! The adventures of this lively little girl and her chums little-friend – Susan and Billy Blunt – first appeared over eighty years ago and they have been delighting children ever since. These endearing and classic adventures, with Joyce Lankester Brisley's original illustrations, are perfect for reading aloud and sharing with young readers. 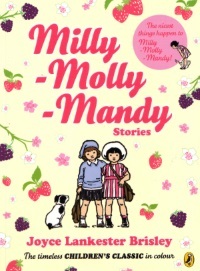 Please Note: Since the publication of Brisley's original six books, the Milly-Molly-Mandy stories have been compiled and published under a variety of different titles including: The Adventures of Milly-Molly-Mandy; The Milly-Molly-Mandy Storybook; Milly-Molly-Mandy's Summer; Milly-Molly-Mandy's Autumn; Milly-Molly-Mandy's Winter; Milly-Molly-Mandy's Spring; Milly-Molly-Mandy's Adventures; Milly-Molly-Mandy's Friends; and Milly-Molly-Mandy's Family.